1. 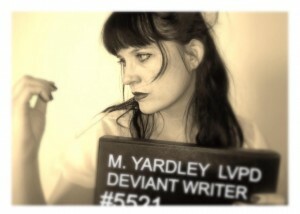 So, what do new readers need to know about Mercedes Murdock Yardley? I’m the girl next door with poisonous flowers in my hair and I write whimsical horror. I live in Las Vegas with a small zoo of kids, chickens, a rabbit, fish, and an angry, cranky turtle. My father made me an anklet of small bells so I chime when I walk. I write like crazy and most of it is fairly dark, but still hopeful. That’s me in a nutshell. 2. 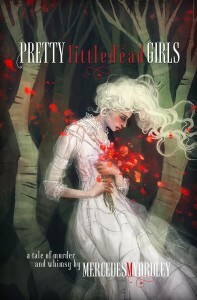 What was the inspiration behind Pretty Little Dead Girls? Pretty Little Dead Girls came from a myriad of places. It’s partly based on my home town out in the middle of the desert. It’s beautiful but deadly, and when you’re sitting outside under the stars at Rabbit Mesa, you’re watching the desert and feeling like it is watching you right back. I also had a man come up to me once and say, “You’re the type of girl who gets murdered, you know.” And he was so heartbroken! He was mourning this impending death that he felt I was going to have. That stayed with me. Marry these things together and you have Bryony Adams, the woman who was destined to die. 3. Do fairytales underpin much of your work, either overtly or covertly (you know, wearing trench coats, dark glasses, lurking in dark alleyways)? They very much do, in a way. Fairytales and folklore are such a part of learning and history. That used to be how lessons were taught, through fairytales. This is how I learned my lessons as a kiddo. Work hard and be rewarded. Don’t talk to strangers. Be a clever girl and outsmart witches. So I see quite a bit of that in my work. I adore the fanciful and lovely, and fairytales are horrifically dark, as well. Perfect. Simply perfect. 4. How did you connect with Ragnarok Publications? It was a delightfully random thing! Joe Martin of Ragnarok contacted me and basically asked if I had anything to send them. I wasn’t familiar with Joe, but I knew his business partner, Tim. They’re just stellar guys who work really hard. I had a novella that I was writing at the time, and I asked if they’d like to take a look at it when I was done. Now I’ve published three books with them and I’m contracted for two more. They’re fantastic publishers and I couldn’t be more pleased. 5. Tell us about the cover art from the very talented Galen Dara! Oh my goodness! Galen was always my dream artist for this project. Her art is so ethereal and deliciously dark. I was over the moon when she agreed to create the cover art. I sent her a few scenes and told her the basics of the story. I tried to convey the ambiance of the Star Girl, and she nailed it beautifully. I knew she would. 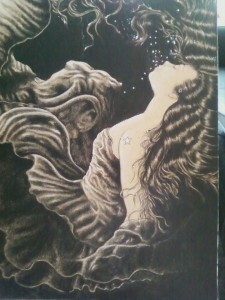 Artist Orion Zangara also created a special and beautiful piece of art for the limited edition signed hard cover copy. It’s a scene from the book and it’s simply stunning. I have the original piece and I’m trying to figure out which wall to hang it on. It’s beautiful in pictures, but seeing it in real life? It quite took my breath away. 6. In general, who and/or what are your writing influences? That’s a good question. My writing has been influenced by Erma Bombeck. She was hysterically funny and wasn’t afraid to show her wit without being cruel about it. I was also heavily influenced by Gabriel Garica Marquez’s One Hundred Years of Solitude. I studied that book in college and oh, how I originally loathed it! The storyline and generations of family were hard to follow. But the imagery was so striking and unique. It was really my introduction to magical realism. I thought, “I can really write like this?” I found a place. I found where I belonged. 7. When did you first decided you wanted to be a write? I knew by the third grade that I always wanted to write. It was such joy for me, and a way to get my imaginings out of my head and onto paper. When I was older, I talked myself out of writing because it didn’t seem adult and responsible enough. It gave me great happiness, yes, but adulthood isn’t for happiness; it’s for hard work and grown-up things. At least, that’s what I thought. I began to write again and it put my soul back together. 8. Who is your favourite villain in fiction? I adore Hannibal Lecter. He’s frightening, he’s intelligent, he’s charming. The fact that he keeps himself under such tight lock and key is frightening to me. He has self-imposed rules on who he does and does not kill. That type of insanity in a very contained personality is horrifying. He’s a brilliant villain. 9. Who is your favourite heroine/hero in fiction? I’d say my favorite hero is Schmendrick the Magician from Peter S. Beagle’s The Last Unicorn. He’s atypical. He’s a soft-spoken and perpetually weary character, but his heart is good. There are a few story tie-ins that Beagle wrote about Schmendrick, and it’s intriguing to see them and the depth of his character. 10. What is next for the Mercedes Machine? 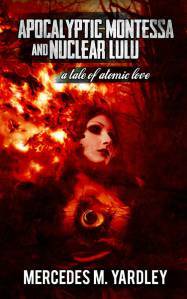 I have a novella coming out in February! It’s part of The Grimm Mistresses collection that four women in horror are tackling. We’re each modernizing a Grimm fairytale and putting them out in one omninovel for Women in Horror Month. That’s a lot of fun. 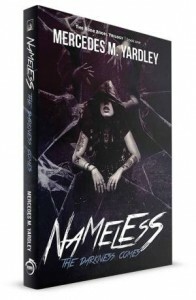 I’m also working on the sequel to my urban fantasy, Nameless. But what I’m most excited about is finally starting a novel that’s been gnawing at the back of my brain for about a year now. Its working title is “The Kitchen Witch” and I’m in love with the main characters, Belladonna and John. I haven’t had a chance to start this book, and I blocked out all of November and December to work on this and this alone. It’s my own little reward for having such a crazy year. Thank you so much for the Interview, Angela! I enjoyed your questions very much. 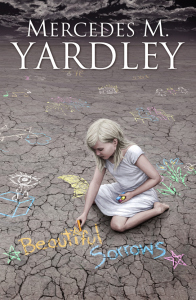 This entry was posted in fairy tales, News, On Writing: General and tagged Galen Dara, Mercedes Murdoch Yardley, Nameless, Orion Zangara, Pretty Little Dead Girls, Ragnarok Publications. Bookmark the permalink.